In our compact AqualityBox® system, the complete electrolysis process is installed. That includes all the necessary equipment for dosing and measuring the injected biocide. The AqualityBox® product range has capacities to produce sodium hypochlorite ranging from 3, 6, 30, 60 up to 200 g/h. 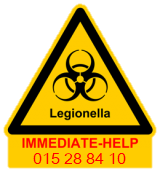 Proven to be very efficient against Legionella in water and biofilm in water pipes, even at low concentrations of 0.2 mg/l, during long term disinfection. No loss of quality due to transport and storage, typically for chemicals. A minimum of disinfection by-products are formed. 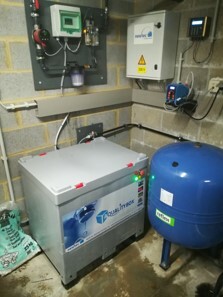 AqualityBox® generates a low concentration of sodium hypochlorite (up to 0,8%), which is produced out of common kitchen salt and water ‘on demand’ on site. This avoids hazardous substances that must be labelled and replaced according to the EU-regulations. AqualityBox® is built according to the Plug & Play principle and by using a simple transpallet the system can be installed and removed in a very short period of time, making it extremely suitable for mobile applications. AqualityBox® is suitable for shock and long-term disinfection, for both hot and cold water disinfection. No transport, no storage, no handling and no disposal of hazardous chemicals. Using only salt and water; no by-products or consumables.